“The system continues to be developed with direct feedback from those that need these tools to do their job efficiently and safely,” explains Mike Morrow, CEO. The market told us they need this new mobile video stream on-demand capability to help Commanders and Supervisors better understand what is happening in the field when fixed or vehicle cameras aren’t in position to capture what’s happening and when critical decisions have to be made quickly. A large International Police Force has deployed this to the field and also see this as a lifesaving tool. When an officer is not responding to messages, and an alert is sent from their Responder Watch app due to a low heart rate, opening their phone’s video and microphone helps assess the situation and get them help from the nearest officer located through the CommandWear software. The goal is to use cost-effective, commercially available, smartphones and smartwatches to help save lives through secure and integrated vital monitoring, location tracking, alerting and live video streaming capabilities,” explains Morrow. 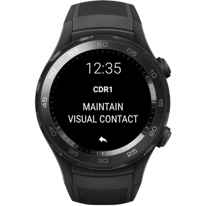 The CommandWear Communicator V4.3 smartphone app with companion smartwatch app is available for immediate download in the Google Play Store. The app is also available for iOS (iPhone) in the Apple iTunes Store, but the new features announced today will be added to iOS at a later time. Users require an annual CommandWear Cloud Server subscription to operate. The smartwatch app runs on Android Wear 2.0 compatible smartwatches listed here. Apple Watch, Samsung Gear and other smartwatches can continue to be used with CommandWear’s software for basic messaging functions. Founded in 2013, CommandWear is an award-winning wearable and mobile situational awareness software developer. The public safety technology company was one of ten start-ups selected to participate in the US Department of Homeland Security EMERGE program and a winner of the World Information Technology and Services Alliance’s Emerging Digital Solution.